Thank you parents for that lovely breakfast. It has truly been a wonderful year in Grade One. Thanks to Connie and Ranko for this photo story. 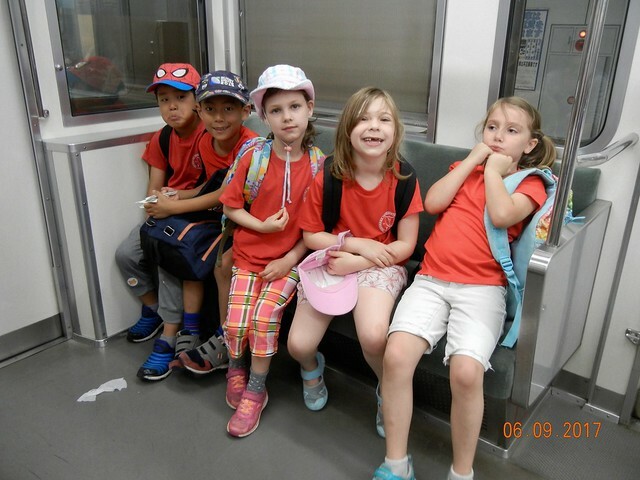 Returning to the Tamagawa area for Picnic Day, the children knew exactly what to do to have fun. This time more confident than before, they just got on with it, sitting down only for a snack and lunch, and then off to explore, run, climb, build, chase butterflies-playing the entire time. In contrast, the adults had a very relaxing time with almost no issues, noticing how much more capable our soon-to-be-second graders, have become. A big thank you to Jiyaa’s mum and EAL teacher Graham Liang for joining us and a big thank you to Connie for taking these wonderful photos. The sleepover was a huge success. The general consensus was that the children want to do it again. Thank you to Alex Thomas for being our extra chaperone and a big thank you to our 3 Grade 9 buddies for playing with us in the park. The sleepover is packed with academic and social learning opportunities. We wanted to share it with parents and wonder what else you would add from your perspective. -Being away from home overnight and understanding the feelings this gives you. A big thank you to Mrs. Weekes for making these slideshows. Getting Ready for the Grade One Sleepover? The children are very excited about the sleepover and have waited very patiently to start the planning process. Today we started the planning process, and children are very excited to learn that we will be sleeping in the ICJC building (next to the gym). We used this last year and being in our own “house” was very exciting to the children. The children are excited about managing their own belongings and routines. It will be easier for the children to look after their belongings if they are clearly labeled. The children should practice packing and unpacking their bags by themselves, several times, so that they know exactly what they have in their bags, where to find everything and how to fit it all in. (Sleeping bags can be particularly tricky.) This will help the children feel a sense of control and independence and will ease anxiety. We talked about how everything has to fit in one overnight bag and the importance of “packing light”. While we have discouraged the children from bringing big suitcases (for space and storage reasons), it is important that the bag is big enough for children to fit ALL their belongings inside easily. We proposed that the sleepover be ‘unplugged’, with no electronic devices, after much debate the children have agreed. The children were thrilled to find that some of the tadpoles/froglets had changed into frogs over the weekend. This brought a lot of inquiries. How would we feed them? Our research shows that the frogs feed on very small insects. Can we find small aphids nearby? We took a look and were happy to find what we thought would make suitable food. Gathering this food will require commitment, were we prepared to take on this responsibility? We had a vote and the result was unanimous. We would keep and take care of them. This meant that the children will need to use some of their free inquiry time to find food and to research how to create and maintain a suitable environment for their class pets. They all seem committed. Thank you to Jiyaa and Eliza for taking these photos. A big, big thank you parents for coming in to help us design our headbands and banner for Sports Day. The children are very proud of their work, and very grateful for your help. The children continue to develop their measuring skills. This week the children inquired into measuring volume through making play doh. Using the tried-and -true Grade One recipe that Mrs Weekes and Ms Connie have perfected, the children measured flour, salt, boiling water, cream of tarter and food colouring to make perfectly soft and spongy play doh in vibrant colours. Children spend much of their Free Inquiry creating and playing with their self-made play doh. Estimating and measuring height became necessary when Annemijn, our wonderful student teacher from Holland who spent the week with us, walked into the room. The first thing the students wanted to do was to find out how tall she was and they impressed her with how closely they estimated her 174 cm height. Children noticed stark changes in length with our living things this week. The students’ edamame bean plants grew considerably in height, requiring the need to plant them outside in soil. Another growth in length was the legs of the tadpoles that were first discovered on Monday. By Friday, the biggest tadpole’s legs were over 1cm long and seemed to be growing as our tadpoles continue to look more like frogs each day. As the children chart the changes in these growing living things, they continue to developing understanding of life cycles and the process of change-while developing their understanding of different purposes of measurement. We have been inquiring into measuring height this week. Using meter sticks, children developed understanding of the length of a meter. Rea lizing that everyone in the classroom is taller than one meter, the children made estimates on the height/ length of objects in the classroom including their own height and the height of the classroom door. They wondered who was taller, Ms Zoe or Ms Donna. They also wondered about the height of the older students they noticed on the playground. The children were very happy with the wonderful response they got when they asked if they could measure the height of three students in middle school. These students graciously came into our classroom, listened to our estimates and then let us measure them with two meter sticks. The children started to look out for other people they could measure. How about Jake? They knew that Jake, Ms Donna’s son was a senior in High school, was he taller than the middle school students? They made estimates on his height and kept a look out for him on the playground. They noticed Mr Ken, who works with Grade 2. They asked him to come in to get measured. The children were getting considerably better at estimating. They knew Mr Ken was taller than Ms Donna and shorter than our 2 meter door and impressed Mr Ken with their logical estimates -some were spot on! Just as we were measuring Mr Ken, Jake walked into the room. It was perfect timing. The children could compare to see who was taller to help them make close estimates on Jake’s height. Many children refined their initial estimates and made even better estimates on Jake’s height, 182 and 1/2 (They learned about 1/2 when measuring their own height earlier in the day). A big thank you to all the people who gave us their time to help us with our mathematical inquires. Thank you parents for your support with our Student Led Conferences and allowing your child to be the teacher. It was wonderful to watch the confidence the students displayed while leading their parents throughout the various learning engagements and wonderful to note mutual respect. The laughter that permeated was indication that all were having a great time. What Happened to Our Toad Eggs? The children seemed very happy to be back at school after the Spring break, but were surprised to see that the fish tank was empty. Why did the tadpoles in grade one not survive? Taito, on his first day in 1S, suggested that possibly the water was poisoned. What caused this? Did we have too many eggs for our small fish tank? We used pond water but that seemed not to be the correct choice. Luckily Ms Czubak’s tadpoles in grade 2 were fine and she shared some of hers with us. Committed to help these thrive, the students went back to the books and videos to research. We also went to Ms Csubak and asked what she thought. Ms Czubak said that she used tap water and suggested that the water choice may have been why her tadpoles survived throughout the Spring break. Some books suggested using half pond and half t ap and all sources indicated that tap water is dangerous right out of the tap and needed to be set out for awhile before using. Could the location in the room also be a factor? We decided to do an experiment to see what conditions might be the best. We gathered some pond water and placed one jar with tadpoles in half pond water and half tap water in a different place in th e classroom. We put another jar with only tap water near the window, and left the other tadpoles in the original place with only tap water to see if th e type of water and location has an effect on our tadpoles. We are looking forward to seeing the results next week. We, also spent some time this week in the beautiful Yokohama Necklace Garden. The children loved seeing the displays and playing outside. This is a great time to explore the changes in nature, which fits in with our Unit of Inquiry about all living things going through a process of change.